Dubai's Department of Tourism and Commerce Marketing (Dubai Tourism) proudly revealed today the much-awaited #BeMyGuest campaign video, featuring Bollywood Baadshah Shah Rukh Khan. While the first video, which took YouTube by storm last year, featured Shah Rukh Khan surprising residents and visitors around Dubai, this year Shah Rukh Khan explores what he considers to be his second home and takes viewers on a fascinating, multi-faceted journey through the city of endless possibilities. Marking the first-ever collaboration between Shah Rukh Khan and acclaimed Bollywood director Kabir Khan, the newly launched 2.0 #BeMyGuest portrays Shah Rukh Khan's journey across a series of short films that see him taking visitors to Dubai through a multifaceted destination that holds global brand appeal in much the same way he does as an actor. 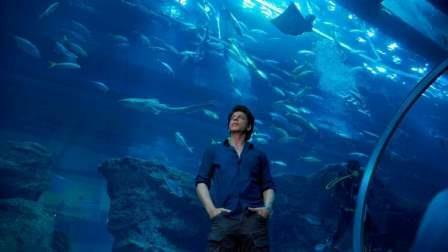 Shah Rukh Khan reaches out to his legions of fans across the globe, and introduces them to the lives of four different characters,and how he personalises each of their experiences of Dubai by injecting the warmth and spirit of the city that resonates with him, yet each customised to the needs of every visitor. The stories allow audiences to explore Dubai and its variety and diversity of stunning tourist offerings, with SRK in his signature style leading them to create new memories and rekindle old ones in the city. The mini series with a hero compilation has been shot across picturesque and iconic locations in the city, including Dubai's incredible range of themeparks - specifically covering LEGOLAND® Dubai and Bollywood ParksT Dubai; signature locations such as the Dubai Aquarium, Dubai Fountain and The Palace Downtown Dubai; and reveals secret treasures that showcase the stunning range of Dubai's liberating landscapes, such as the mountainous Hatta region. Shah Rukh Khan commented, "Last year I invited my fans around the world to "Be My Guest" while giving them a glimpse into my Dubai, as part of this exciting partnership with Dubai Tourism. This year, along with one of Bollywood's most recognised directors, Kabir Khan, we're taking that partnership further to exploring new places and attractions but with the signature essence of Dubai that truly makes it a place where every visitor can feel like they belong to even greater heights. I love this amazing city and I'm really looking forward to once again sharing my experiences with my fans." Conceptualised with the aim to strengthen the connection and cultural links between Dubai and the subcontinent, the video underlines the importance of the audiences from the subcontinent and the vast diaspora as the top source markets for inbound and repeat visitation to the emirate. Dubai hopes to use this campaign to further drive first-time visits from the market bases, as well as increase the propensity of those that have visited to come more often by showcasing an ever evolving tourism proposition. Issam Kazim, CEO, Dubai Corporation for Tourism and Commerce Marketing (DCTCM), says, "We are delighted to partner with Mr. Shah Rukh Khan once again for the new edition of this very special project, #BeMyGuest. There is no one quite like him - with his charisma, global appeal, and most importantly because he truly considers Dubai to be his second home and shares so many similarities with what Dubai stands for. Our video last year that saw Shah Rukh surprise and delight people in Dubai, garnered great response from across the world, but that was only the beginning of our journey." He continued: "This time around, we continue to celebrate this strong bond by capturing Shah Rukh Khan directly exploring the city and what it has to offer to audiences across different age groups and demographics. We are also very pleased to work with Mr. Kabir Khan for the first time, as he has brought to life Dubai's extensive tourism proposition, while weaving in Shah Rukh's unique relationship with the city. We look forward to sharing this series with our global audiences and the international dispora as well as the wider global fanbase of Shah Rukh Khan." Talking about this collaboration, director Kabir Khan added, "It's been an absolute dream come true to work on this campaign with such power house names. I have always aspired to work with Shah Rukh, the charisma he brings to every shot is admirable, while Dubai has been one of my favourite cities to visit. In these films, we've done our best to capture the essence of Dubai, from its stunning locations to its welcoming hospitality. After working so closely with both Dubai Tourism and Shah Rukh Khan, I can confidently call Dubai my home and cannot wait to be back."